2015/04/22 Champward Epoxy Primer Material CG-1032 is certificated with Healthy Green Building Material from the Architecture and Building Research Institute, Ministry of The Interior. 2015/04/22 Champward Epoxy Resin Paint CG-5000 is certificated with Healthy Green Building Material from the Architecture and Building Research Institute, Ministry of The Interior. 2014/09/18 Champward PU Athletic Installation Material CM-3102、CM-3202、CM-3502 and CM-3602 is certificated with Green Labels from the Environmental Protection Administration Executive Yuan. 2014/07/07 CNS Mark Certified Products are Regular Reviewed by the Taiwan Paint Industry Association. 2014/06/09 Champward Water-Base Masonry Paint CA-701, CA-711, CA-741 and CA-751 is certificated with Healthy Green Building Material from the Architecture and Building Research Institute, Ministry of The Interior. 2014/05/30 ISO 14001 Environment Management System is Annually Reviewed by TUV Nord. 2014/05/30 ISO 9001 Quality Management System is Annually Reviewed by TUV NORD. 2014/05/07 ISO 9001 Quality Management System is Annually Reviewed by the Bureau of Standards and Metrology and Inspection. 2014/04/11 Champward Roof Coating for Waterproofing (Acrylic Resin Type) CA-100、CA-110、CA-120、CA-140、CA-150、CA-160、CA-180及CA-190 is certificated with Healthy Green Building Material from the Architecture and Building Research Institute, Ministry of The Interior. 2014/04/11 Champward Epoxy Resin Finish CG-4064、CG-4364、CG-4404、CG-4454、CG-4464及CG-4894 is certificated with Healthy Green Building Material from the Architecture and Building Research Institute, Ministry of The Interior. 2014/04/11 Champward Epoxy Resin Paint CG-5064、CG-5364、CG-5404、CG-5454、CG-5464及CG-5894 is certificated with Healthy Green Building Material from the Architecture and Building Research Institute, Ministry of The Interior. 2013/08/08 Champward Water-Base Masonry Paint CA-701, CA-711, CA-741 and CA-751 is certificated with Healthy Green Building Material from the Architecture and Building Research Institute, Ministry of The Interior. 2013/05/27 ISO 14001 Environment Management System is Annually Reviewed by TUV Nord. 2013/05/27 ISO 9001 Quality Management System is Annually Reviewed by TUV NORD. 2013/05/22 ISO 9001 Quality Management System is Annually Reviewed by the Bureau of Standards and Metrology and Inspection. 2013/04/25 CNS Mark Certified Products are Regular Reviewed by the Taiwan Paint Industry Association. 2013/01/24 Champward PU Floor Coating CM-200 is certificated with Healthy Green Building Material from the Architecture and Building Research Institute, Ministry of The Interior. 2012/06/22 ISO 14001 Environment Management System is Annually Reviewed by TUV Nord. 2012/06/22 ISO 9001 Quality Management System is Annually Reviewed by TUV NORD. 2012/05/18 ISO 9001 Quality Management System is Annually Reviewed by the Bureau of Standards and Metrology and Inspection. 2012/04/26 CNS Mark Certified Products are Regular Reviewed by the Taiwan Paint Industry Association. 2010/05/18 CNS Mark Certified Products are Regular Reviewed by the Taiwan Paint Industry Association. 2010/05/07 ISO 14001 Environment Management System is Annually Reviewed by TUV Nord. 2010/05/06 ISO 9001 Quality Management System is Annually Reviewed by TUV NORD. 2010/04/16 ISO 9001 Quality Management System is Annually Reviewed by the Bureau of Standards and Metrology and Inspection. 2009/06/24 CNS Mark Certified Products are Regular Reviewed by the Taiwan Paint Industry Association. 2009/06/02 Champward MDI PU Waterproofing Material CM-1922, CM-1022, CM-1122 and CM-1522 is certificated with Healthy Green Building Material from the Architecture and Building Research Institute, Ministry of The Interior. 2009/06/02 ISO 9001 Quality Management System is Annually Reviewed by TUV NORD. 2009/06/02 ISO 14001 Environment Management System is Annually Reviewed by TUV Nord. 2009/04/27 ISO 9001 Quality Management System is Annually Reviewed by the Bureau of Standards and Metrology and Inspection. 2008/07/23 ISO 9001 Quality Management System is Annually Reviewed by TUV NORD. 2008/07/23 ISO 14001 Environment Management System is Annually Reviewed by TUV Nord. 2008/06/16 CNS Mark Certified Products are Regular Reviewed by the Taiwan Paint Industry Association. 2008/05/02 ISO 9001 Quality Management System is Annually Reviewed by the Bureau of Standards and Metrology and Inspection. 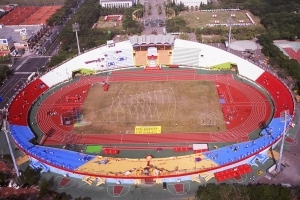 2008/04/08 Complete 400m Running Track of Kun Shan University. This project adopted Champward CW-362 Full Pour System. 2008/03/01 Champward CW-362 Full Pour System / Champward CW-363 Sandwich System / Champward CW-364 Structural Spray System is Certified Track Surfacing Products from IAAF. 2007/10/26 Champward Aqueous Waterproofing Paint CP-701 and CP-741 is certificated with Green Labels from the Environmental Protection Administration Executive Yuan. 2007/07/09 ISO 9001 Quality Management System is Annually Reviewed by TUV NORD. 2007/07/09 ISO 14001 Environment Management System is Annually Reviewed by TUV Nord. ISO 9001 Quality Management System is Annually Reviewed by the Bureau of Standards and Metrology and Inspection. 2007/03/30 China Sportshow 2007, Let's meet in Chengdu! Champward Chemical is at China Sportshow 2007 - the largest sporting facilities exhibition in China at Chengdu New International Convention & Exposition Center, Chengdu, Sichuan, May 17 - 20, 2007. It would be a great pleasure to welcome you at our booth: 6B-104, 105.